As the U. S. faces a growing shortage of highly skilled workers, a new report makes the case that the role that quality child care plays in the education and workforce pipeline has been overlooked. The report, Workforce of Today, Workforce of Tomorrow: The Business Case for High-Quality Childcare, from the U.S. Chamber of Commerce Foundation’s Center for Education and Workforce calls high-quality child care a “two generation approach” to workforce development. Quality child care helps young parents advance their education, raises workforce participation and productivity, and helps business attract and retain talent. At the same time, it ensures that children are well prepared to thrive in school, work and life. The full report is available for download. 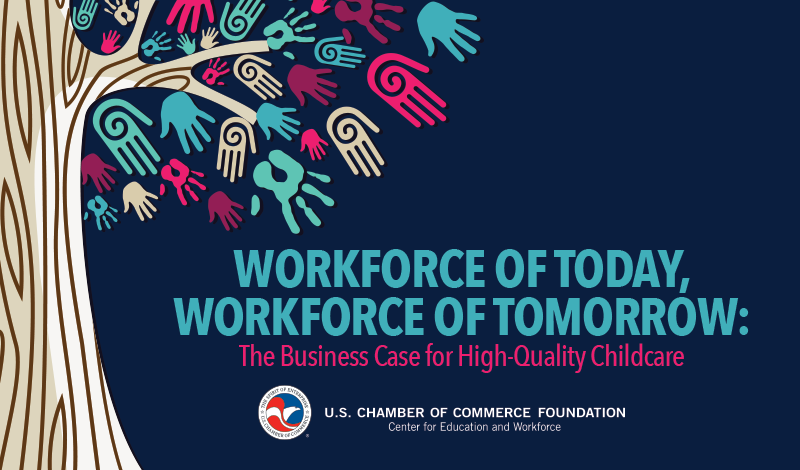 Click the image above to download Workforce of Today, Workforce of Tomorrow: The Business Case for High Quality Childcare from the U.S. Chamber of Commerce Foundation.